Perfect as a holiday side dish or for weeknight dinner – these Vegan Scalloped Potatoes are always a good idea. Delicious creaminess comes from the coconut milk sauce and vegan cheese on top is totally optional. 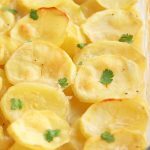 This recipe idea for dairy free scalloped potatoes first came to my mind years ago when we realized that my husband is quite sensitive to lactose and dairy products in general. But when it came to holiday dinners and my family where everyone can eat pretty much everything, it was tough for him. To ensure there was at least one comfort food side dish for him to enjoy at the holiday dinner table I came up with this completely dairy free baked scalloped potatoes dish for him. And everyone else could enjoy them just the same. 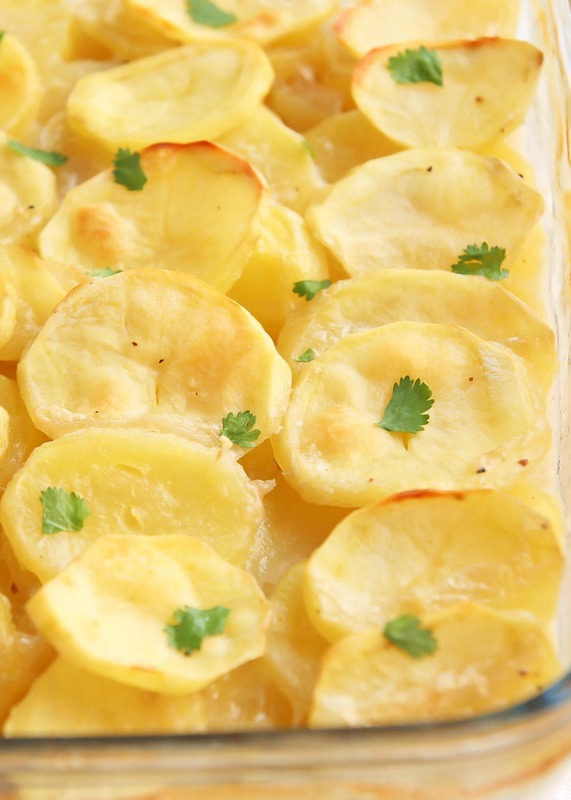 Russet or Yukon Gold are the best potatoes for scalloped potatoes. 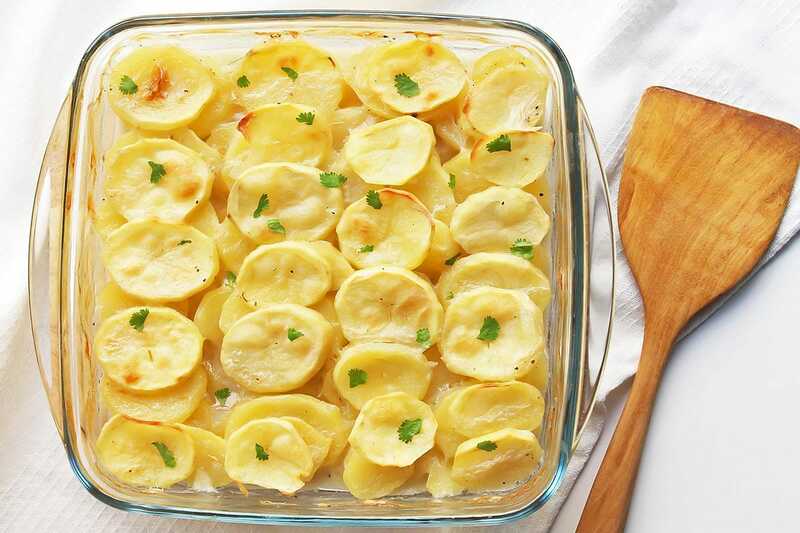 Russet potatoes make especially creamy scalloped potatoes because of their high starch content. While Yukon Golds hold their shape better. Personally, I like to use Russets the best for these vegan scalloped potatoes. Since we are not using actual dairy cream, I feel like we can use all the help we can get to make this dish as creamy as possible. This easy scalloped potatoes recipes require a simple 2-part prep. First there are the potatoes that need to be peeled and sliced, and then there is the vegan scalloped potatoes coconut milk sauce. The creamy sauce that the sliced potatoes are baked in is made from coconut milk and vegetable broth that is thickened with potato starch (or other starch of your choice, like corn, tapioca starch, or arrowroot powder). It is hard to believe that this delicious creamy sauce includes no dairy cream whatsoever. To make the sauce, bring the coconut milk and broth to a boil together with garlic, salt and pepper. In the meantime make a simple slurry with the starch and a little water. When the coconut milk is boiling, take it off the heat and whisk in the slurry. Return to the stove for a minute or so and keep whisking until the sauce is thickened. You can either pour the sauce over the potatoes in a separate bowl to combine, but I usually just add both to the baking dish and combine them in there. Whether you want to arrange the slices in a nice fanned out pattern or simply spread them out is totally up to you. For these scalloped potatoes no cheese topping is necessary. Instead, I finish off the homemade scalloped potatoes under the broiler to create a crispy, browned top. It’s a great texture contrast to the creamy, tender potatoes underneath. But of course if you prefer scalloped potatoes with cheese, you can also sprinkle the top with vegan cheese or give these simple scalloped potatoes a breadcrumb topping. There are 3 ways to cut scalloped potatoes. At least these are the three I can think of. To cut the potatoes quick and easily you’ll need a kitchen tool like a mandoline or a food processor with a slicing disc. 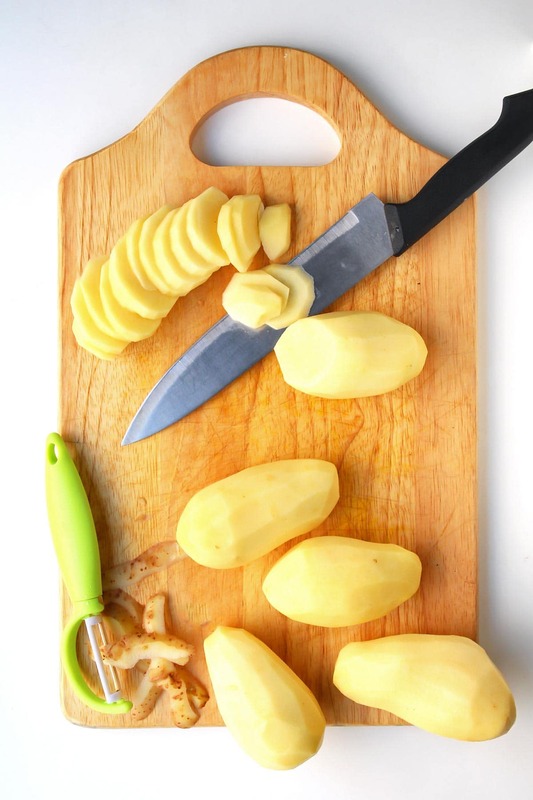 But of course you can always slice the potatoes the old fashioned way by hand with a sharp kitchen knife – although this is definitely the hardest and most time consuming way to do it. If you have leftover scalloped potatoes from the day before you can reheat them either in the microwave or on the stovetop in a covered skillet with a splash of water in the bottom. 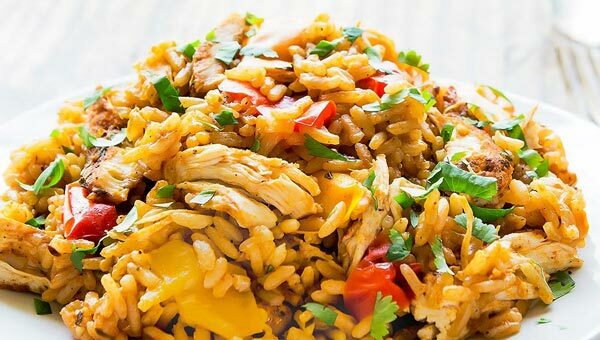 But if you want to retain some of the same baked crispy texture, return the vegan potato casserole to the oven or use a toaster oven for reheating leftovers. 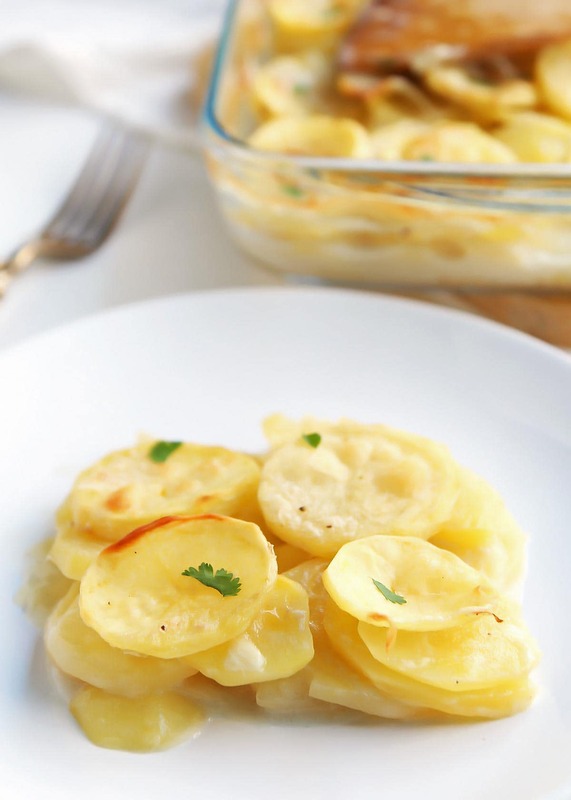 You can also make these healthy scalloped potatoes ahead of time and store them in the freezer. 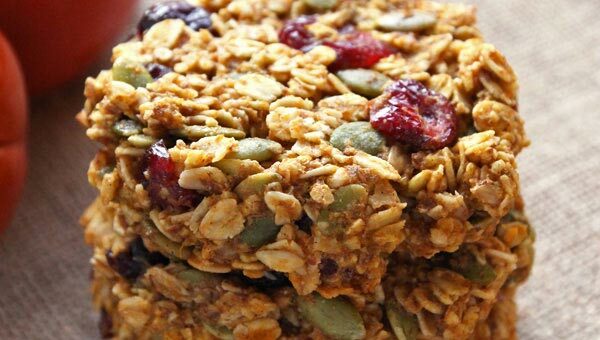 In this case bake them only partially for about 25 minutes, then let them cool down before covering and freezing. Once ready to eat, let the gluten free scalloped potatoes defrost in the fridge overnight, or bake from frozen until heated through and tender (30-45 minutes). 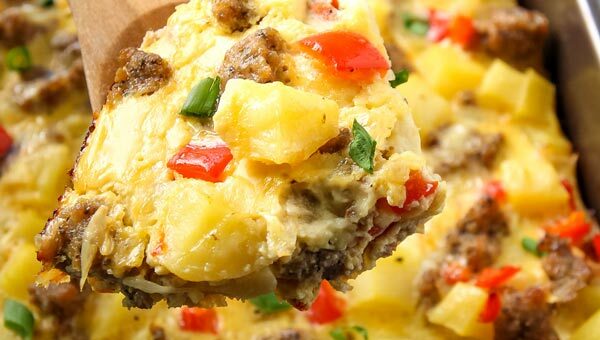 Don’t freeze this dairy free potato bake raw. Because of their high water content raw potatoes don’t freeze and defrost well. The texture will be much better if you bake it at least partially before freezing. I baked these best ever scalloped potatoes in my 8 inch Pyrex glass baking dish. 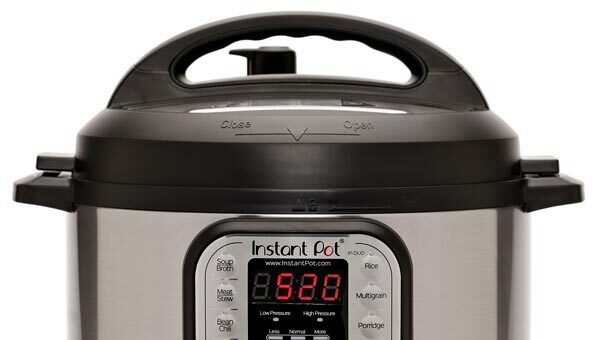 I love that it comes with a fitting lid for transport or for storing leftovers. The easiest way to slice the potatoes for these quick scalloped potatoes is a food processor with slicing disc. I am seriously in love with how much kitchen prep my food processor does for me. Perfect as a holiday side dish or for weeknight dinner - these Vegan Scalloped Potatoes are always a good idea. Delicious creaminess comes from the coconut milk sauce and vegan cheese on top is totally optional. Preheat your oven to 350 F. Grease an 8-inch square baking dish with the coconut oil. Peel and slice the potatoes to 1/8 inch thickness. In a small bowl stir together potato starch and water to make a slurry. In a small saucepan, bring coconut milk and broth to a boil with the minced garlic cloves. Season to taste with salt and pepper. Once boiling, take off heat and whisk in the starch slurry. Return to heat and keep whisking until sauce has thickened - about 1 more minute. Layer potato slices and sauce in the prepared dish. Bake for about 45 minutes until the potatoes are tender. Turn on the broiler for about 5 minutes to brown the top of the scalloped potatoes. Serve hot! 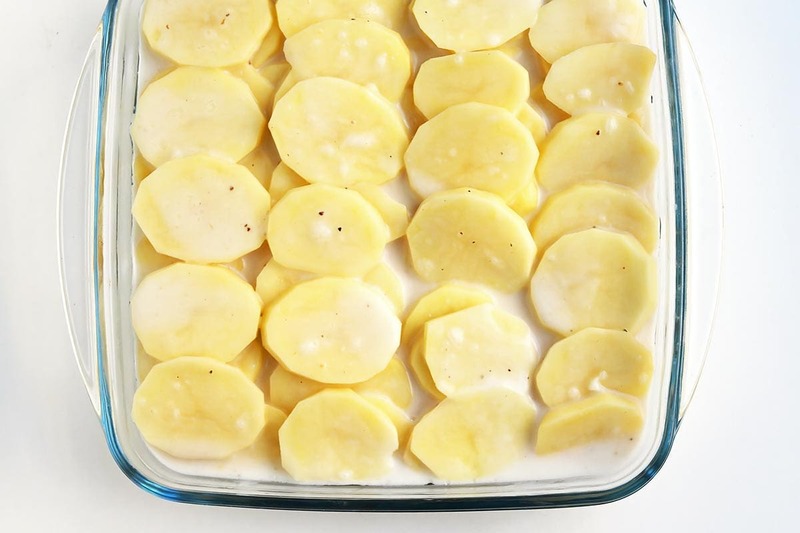 You can easily double the recipe, you just will have to bake the scalloped potato casserole for a longer time or in a larger (9x11 inch) baking dish.